Intrepid reporters Gary and Lorraine take No Crowds to new heights - this time adding a great recipe to their travel advice. Most of us have heard of Sharm el-Sheikh, on Egypt’s Sinai Peninsula by now—home of exquisite diving and less than successful Middle East peace talks. Less well known is a former fishing village that sits just across the Red Sea from Sharm, known as Hurghada. A charmingly run down quasi resort, Hurghada has clearly spent much of the last 30 years catering to those from the northern climes. From the Air Berlin plane on the runway of the local airport, to the Finnish newlyweds who just got off the charter from Helsinki, to the billboards and shop ads in Russian, German and Arabic—the signs are everywhere. At a fraction of the cost of Sharm, Hurghada also has some of the most spectacular diving and snorkelling in the world. The Red Sea is as deep as the Atlantic, and as crystal clear as the Caribbean on a fine day. The fish that inhabit the plentiful coral reefs are not to be believed. Simple snorkelers, we saw butterflyfish, trumpetfish, Napoleon fish, tigerfish and others we couldn’t hope to identify, all in riotous colours. Frankly, our heretofore favourite spot, the reef wall in Providenciales, (in the Turks & Caicos Islands) paled by comparison. Hurghada is also the center of a growing region that includes el Gouna (20 km to the north), a made-for-tourists town including several resorts built across multiple islands with gorgeous lagoons in place of swimming pools. And 20 km south is Sharm el Naga, a bend in the road that has no infrastructure but a glorious beach with arguably the best snorkelling directly off the beach of any place in the world. But what we want to talk about is a restaurant. It’s called the Nubian Egyptian, a simple open air collection of tables in the midst of Hurghada’s New Marina, and it’s quite an experience. Most main dishes are grilled, but that means something different here. Order the red snapper, for example, and it arrives still cooking on a small charcoal grill the size of a shoebox, carefully placed on your table so you can help yourself as the spirit moves you. Likewise the lamb kofta and most of the other mains. Each piece was superbly done—best snapper I have ever eaten anywhere, (including rougets done in butter at our favourite Parisian cafe). And the piece de resistance was the garlic sauce (toum, in Arabic). It was close enough to a good garlic aioli to convince you that traders must have taken these recipes on all their Mediterranean trade routes for many years...but oh, the garlic! We asked the proprietor for his recipe and he feigned shock—“you ask me for my secrets?” In the end, he gave us enough clues about garlic, lemons, sea salt and a good mortar and pestle that Lorraine immediately set to work to reverse engineer the sauce when we returned home, with excellent results. The recipe, my friends, follows below. I recommend it to you with two warnings: First, make sure you will be spending the rest of the evening with people who also like garlic and have sampled the sauce, otherwise the outcomes could be unpredictable. Second, should you make your way to Hurghada, keep in mind that a strange bureaucratic glitch in Egyptian law makes it nearly impossible to import wine, and the local red or white wine (with colourful names like Scheherazade, or Omar Khayyam) is generally undrinkable. Happily, the rosé is not at all bad, and makes a perfect accompaniment for everything you can find at the Nubian. Garlic, lemon and olive oil whipped into a pungent creamy sauce and slathered on fish, meat and vegetables is a revered and ancient Mediterranean treat. France, Spain, Italy, and Greece have all claimed to be the originators of this savoury concoction, calling it aioli, alioli, and ali-oli. I, on the other hand, am sure that along with all that gold, King Tut was smart enough to pack away several man sized jars of toum to ease the transition to the afterlife. So I’m betting that Egypt can safely claim to be the originator of this sublime sauce. My attempts at reverse engineering always have two objectives: (1) How can I make this quicker and easier and useful for a week night meal, and (2) How is this dish like something I’ve cooked before, so I can beg, borrow and outright steal from the best with pride? Therefore thanks for this recipes go to, in no particular order: Julia Child (because before cooking any recipe I check to see what Julia says about it); Cooks Illustrated without whom I would have no idea of why mustard makes it easier to emulsify sauces; and finally, the unnamed chef at the Nubian Egyptian Restaurant on the edge of the Red Sea, because great recipes always conjure up great memories. Pr Press peeled garlic cloves (3 – 8) through garlic press and add to mortar with 1 tsp coarse sea salt. Grind until smooth paste. · Into Food Processor bowl fitted with steel blade: Toss 2 egg yolks plus 1 whole egg, 1 Tbs Dijon mustard, grind of black pepper, and juice of the second lemon. · Turn on processor and let run for 15 seconds, then add oil drop by drop for first ¼ cup or so, a thin drizzle for remainder. (at this point you have a nice home made mayonnaise) – Julia says to be sure and not turn off machine till done. 4. 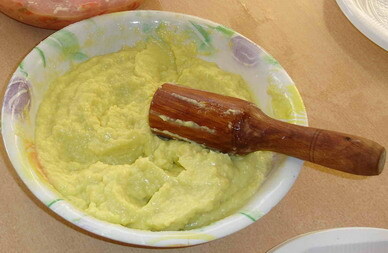 Remove mayonnaise to a bowl, stir in garlic/lemon paste using wooden spoon; adjust S+P to taste. Can be eaten immediately, but sitting in the fridge for 4 hours enhances flavour. Keeps for about 5 days. I was looking for that type of informative post and i appreciate your blog because of unique content so i am very much thankful to you for sharing such a great information. So Who Has Sisterly Chats Anymore?